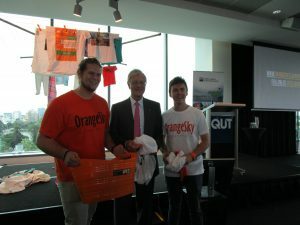 On Tuesday 19 April some of the Giving Australia team from QUT were fortunate to attend a presentation by Nick Marchesi and Lucas Patchett of Orange Sky Laundry. From humble beginnings 18 months ago (one van fitted with donated machines) this charity has now achieved national and international recognition. It operates in 62 locations around Australia, has over 500 volunteers, and to date has washed over 105,000 kg of clothes for homeless people and people in need. Nick and Lucas also told us about the real work of Orange Sky Laundry: “in that one hour of time that the washing is happening…that’s when the magic of Orange Sky Laundry really happens…incredibly positive and incredibly genuine conversation”. They have successfully connected many homeless and disadvantaged friends back to their communities, provided conversation and companionship, as well as employment opportunities. All that, with the added comfort of clean and dry washing. The Giving Australia 2016 project is very interested to hear the opinions of those involved with small and large charities.To participate in the project, or to receive the final report when it is available later this year, please register on our Giving Australia 2016 website. We would like to thank QUT Wellness Matters for organising this outstanding event as well as Nick and Lucas, the extremely well-deserved Young Australians of the Year in 2016. Thanks also to our Chancellor Tim Fairfax AC, a great supporter of the work of the Australian Centre for Philanthropy and Nonprofit Studies. I thought this was a pretty fantastic initiative. Well done to the guys behind it.